My name is Lara and I write a blog called Overstuffed. I named this blog Overstuffed because I have always managed to stuff my life with so many things--wonderful things--that I get easily overwhelmed and often suffer from anxiety brought on by simply looking at my schedule for the day. 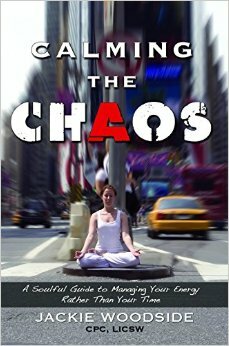 So, when I was asked to review a book titled Calming the Chaos that is all about how to manage my chaotic life better, I was all for it. And let me tell you, I'm so glad I read this book. When I looked at it more closely I wasn't sure if I would agree with the principles the author teaches, but after reading it, I am excited to apply them to my overstuffed life and learn the skills she teaches. I loved the idea that our relationship with time is flawed, and that just by changing the way we think and talk about time will help us to use time to our advantage and become productive rather than busy. I particularly love the energy busters vs. energy boosters and am sorry to report that I am decidedly imbalanced in favor of energy busters. I have made a copy of those two lists to put into my planner to help me remember my personal action plan regarding my energy. There is so much more helpful information in this book. The author, Jackie Woodside, has years of experience helping people just like me to become less stressed and more productive. If you are living a "crazy busy" life and are looking for ways to calm it down, I highly recommend that you read this book. I am excited to read it again and again so I can remind myself often of these wonderful principles and finally learn to calm my chaotic life.